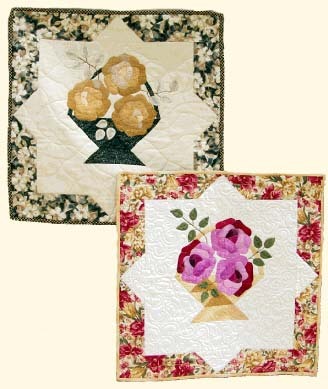 Elegant roses flow from the simply pieced basket. Finishing at just 18 inches square, deceptively simple applique and piecing make this little gem a joy to complete. Enjoy an everlasting bouquet for any decor. As seen on Kaye Wood's Quilting Friends, segment 911, fall 2000.